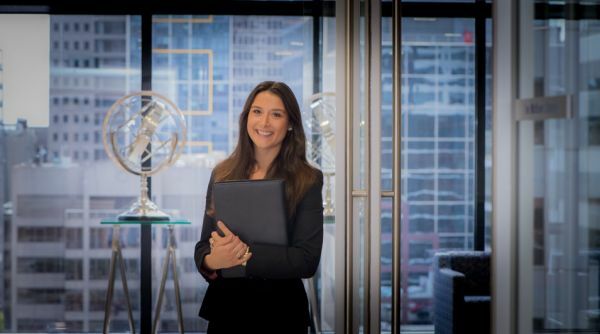 As President of YL, Phoebe represents just over 9,000 law students, young lawyers and later lawyers. “We are a dynamic group established to enhance the legal skills, knowledge and professional networks of members in the early stages of career development,” Phoebe says. Reflecting on her own career journey so far, Phoebe says she would not have been able to have the success she has had without ongoing learning opportunities. Phoebe is an Associate at TressCox Lawyers, where she works on a broad range of employment law matters. She saw undertaking a Masters of Laws (LLM) as an opportunity to continue her vocational education, and to stand out from the pack, professionally speaking. “I decided to undertake further study because I wanted to ensure that I would have the foundation to eventually become a market leader in workplace relations,” she says. Phoebe believes there is a real need for lawyers to undertake further study in their chosen field because of the speed with which the law can change, particularly, workplace relations. Studying for her LLM has provided Phoebe with an opportunity to hear and learn from leaders in her field, with one highlight being a lecture from Commissioner Peter Hampton of the Fair Work Commission during an Occupational Health and Safety class led by a leading barrister in this field, Mr Peter Rozen. “Commissioner Hampton was a member on the Road Safety Remuneration Tribunal which was famously abolished virtually overnight due to political reasons,” she says. Phoebe says one the most important reasons for a young lawyer to pursue further education is the ability to network with their classmates. This is an opportunity that young lawyers often miss out on, or do not have the skills to take advantage of. “The great thing about a Masters is that it attracts like-minded individuals who want to know more about a specific area of law,” she says. Whether it is further education, mentoring or another form of assistance, Phoebe says the most important thing is for young lawyers to reach out for the support which exists for them – an outlook she is hoping to share through her role at YL. “This year, our focus is on mentoring, professional development, mental health and encouraging a young lawyer's community,” Phoebe says. “We have amazing continuing professional development programs and we regularly have social events which range from casual drinks on a weekday to more formal events like the Charity Ball at the end of the year.